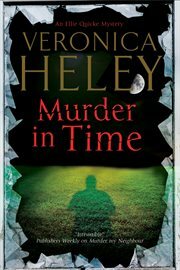 The item Murder in time, Veronica Heley represents a specific, individual, material embodiment of a distinct intellectual or artistic creation found in Evansville Vanderburgh Public Library. Ellie Quicke has her work cut out when past wrongdoings put the future of a child she's grown to love at stake.... Ellie opens the door to a man who is a stranger but instantly recognisable as the father of her housekeeper's brilliant but difficult young son. Mikey had been conceived at a party during which his mother Vera, a schoolgirl, had been drugged and raped. Abdi hadn't wanted anything further to do with her - then. Twelve years later he is a high-flying consultant whose wife cannot have children, and he aims to pay off Vera and adopt Mikey: a suggestion that does not go down well. Ellie discovers that Vera still thinks fondly of her then boyfriend, even though he had also rejected her after that fatal night. But was that because he had fallen out of love with her, or because his father had been murdered that same weekend? Could the two events have been connected? And what part had Vera's closest friends and her family played in the tragedy? Uncovering betrayals between friends and discovering the greed and jealousies behind past events only makes it more difficult for Vera and Mikey to decide on their future . .
Ellie opens the door to a man who is a stranger but instantly recognisable as the father of her housekeeper's brilliant but difficult young son. Mikey had been conceived at a party during which his mother Vera, a schoolgirl, had been drugged and raped. Abdi, Mikey's father, hadn't wanted anything further to do with her - then. Twelve years later he is a high-flying consultant whose wife cannot have children, and he aims to pay off Vera and adopt Mikey: a suggestion that does not go down well. Ellie discovers that Vera still thinks fondly of her then-boyfriend, even though he had also rejected her after that fatal night. But was that because he had fallen out of love with her, or because his father had been murdered that same weekend? Could the two events have been connected? And what part had Vera's closest friends and her family played in the tragedy? Uncovering betrayals between friends and discovering the greed and jealousies behind past events only makes it more difficult for Vera and Mikey to decide on their future.